What is an MERV Rating and Why Does it Matter? You may have heard of the term “MERV rating” when shopping for air filters, but what exactly does it mean? The MERV rating, or the minimum efficiency reporting value, is a measurement of how effective an air filter is at removing dust and debris. MERV ratings range from 1-16 with higher ratings corresponding to smaller filter pores and thus greater air filtration. For example, an air filter with a MERV value of 16 will remove exponentially more air contaminants than a filter with a MERV value of one. So, this means that any filter with a MERV value of 16 must be the best, right? Wrong! While air filters with higher MERV values are more effective at removing contaminants, they also reduce the air flow in your home because of their small pore size. This not only requires a substantial amount of energy, but can actually reduce your home’s air quality by decreasing circulation. 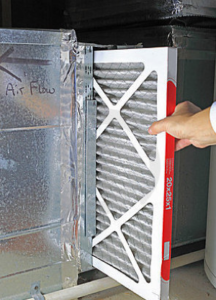 For most residential systems, experts suggest using an air filter with a MERV value between 7 and 12. These filters offer adequate filtration and remove common contaminants such as pollen, mold spores, dust, pet dander, and tobacco smoke. Air filters with a MERV value above 13 are typically reserved for hospital settings. Whichever air filter you decide is best for your needs, it is important to remember to change it frequently to prevent debris buildup. If you need help choosing the best air filter for your home, General Air of Greenville SC is fully equipped to provide accurate assessments and recommendations, with full-service technicians to meet your repair or replacement needs. Contact General Air of Greenville S.C. today to get your heating and air systems operating smoothly again in no time. previous post: How Do I Know Which Air Filter Is Right for Me? next post: How Long Does It Take to Cool My Home with Central A/C?